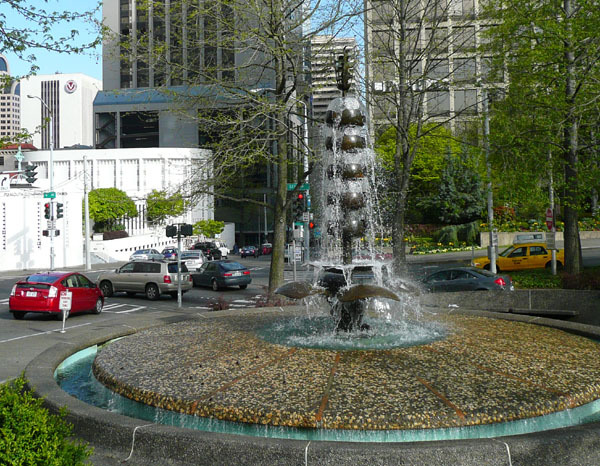 You’ll find the fountain shown above in the southernmost sliver of Freeway Park, tucked between 6th Ave, I-5, and the Seneca offramp. Why would anyone want to spend time here? Why would anyone want to walk here? There is pretty much zero attraction, unless you really really like to look at fountains. Just to the east of the fountain is another strip of Freeway Park that lines the southern edge of Seneca Street as it crosses I-5, shown above. It sure looks cool having all that green (and sometimes purple) bursting out of and hanging down from the concrete. But it’s all for show — rarely would one expect a human to set foot in this bit of park. It’s too loud and it’s too isolated. As the City of Seattle considers a new parks levy, it would also be sensible to look carefully at the parks we already have and assess what works and what doesn’t. Therefore, I hereby nominate the above-described SW corner of Freeway Park as a candidate for The Least Used Park In Seattle. Hugeasscity seeks contending nominees. Posted by dan bertolet on	Thursday, May 15th, 2008 at 9:56 pm. You can follow any responses to this entry through the RSS 2.0 feed. You can leave a response, or trackback from your own site. Greg, don’t ruin Dan’s snark with your “facts.” What you need to know is that Dan hates that fountain. Can’t you see how stupid it looks in that photo? Cars everywhere! Even hybrids – who do those posers think THEY’RE fooling?! What we need is good buildings and photos that are not framed with ROADS and CARS. No one around to hear it? There’s a homeless man that sleeps on the bench right next to it, and another that begs for change from people getting off the I-5 offramp. 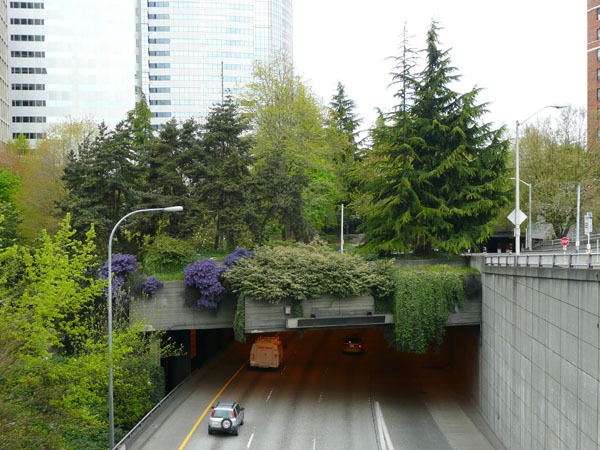 The thing is, Freeway Park is used – by the convention folk, and some people that work at 2 Union. It’s actually a nice lunch spot, when the sun is out (I work at 1 Union and often see people there). The problem isn’t even the freeway – it’s the road infrastructure that surrounds the freeway. 6th is a terrible road, designed for high traffic flow on and off the freeway. This makes everyone avoid the corner with the fountain – because you’ll spend 5 minutes trying to cross the street to get there (not they we’d hang out by a 3-lane, fast moving street anyway). Want to fix the area? Remove the on/off ramp, and put 6th on a diet. Re Freeway Park. I work in Park Place, right next to the park. The plaza area works very well and is a great place for lunch, but every time I stare up at the concrete cliffs looming above I just wonder what Halprin was thinking-probably one of the worst designs ever in terms of CPTED principles. If you were to venture into one of the many creepy little spaces created by the concrete slabs you will find needles, empty beer cans, rubbers and whatever other periphenalia one might use in the privacy of their own home, but would feel perfectly comfortable using in these little out of sight spaces. weird. Seattle Parks has been trying to activate Freeway Park with live music every Wednesday lunchtime, a book cart. It is also a great space for the kids in the Park Place daycare to run around, play games, and create chalk art. But afterhours, super creepy, and it has as much to do with the design as it does with the fact there are no residences around. Another nominee: the park at above the freeway near where Lakeview crosses over the highway on Capitol Hill (near the north end of Bellevue Ave). It’s a nice hill with a grassy lawn that nobody ever seems to use (except on July 4), probably because it’s right above the highway, and maybe also because nobody knows it’s there. Seems like it would be a good spot for an apartment building, given the views — I’d love to see the city trade that lot to a developer for something smaller, flatter, and more central to turn into a park. This highlights a problem I have noticed here in Seattle. We’re so highly sprawled out that we almost have too much public space and not enough public. This means that public areas essentially get taken over by not-so-friendly activities. More density will get more people out into our parks and help mitigate some of these shady on-goings. Just a comment on the Parks Levy. At the meeting the other day, one of the big discussions was between creating or fixing. A lot of people felt that the money could go a lot further by reinvesting it into the parks we already have by increasing functionality and connectivity. @6 – you should go by there on a warm day – if it’s the place i’m thinking of, it’s absolutely mobbed with people fishing. Kind of disgusting but very popular. One of my favorite parks used to be on the water off of Alaskan Way South, near I guess where S. Massachusetts would be. It was a nice piece of industrial shoreline, surrounded by stacks of shipping containers forty feet high, but most of it was taken out, my guess is after 9/11. I think most Seattleites would concur that Freeway Park, for all its beauty as a garden composition, does not (yet) succeed as a public space. Recall however that just a few decades ago, much of Manhattan’s Central Park was ill-frequented and in disrepute. Closer to home, that downtown Seattle was not a residential address. That Pioneer Square stood before the bulldozers. That Belltown had not yet met yuppies. Our Tsutakawa fountain gushing unattended? Perhaps its attraction, for the moment at least, must remain largely subliminal. Let’s check again in 5 years’ time. FYI on Kinnear Park, Im starting a restoration effort at that park here in the next month. If anyone is interested in helping out, let me know. Sabina Pade, that is a really interesting point you make. As I mentioned above there was a large Park Levy voicing to fix the parks we have instead of acquire new ones. Of course, on the other side of the coin is that land continues to be less vacant and more expensive. Thus, we should probably acquire as much park land as possible now and hope that over time, the city will build around it. This is certainly the thought of the Vulcan developers who laid down SLU Park before and not after their major residential developments. I like the way you put it. Freeway park, as far as visual asctetic, is wonderful, but it does not yet succeed as a public space. This statement makes claim to the fact that public space involves a whole community of decisions regarding particular areas, not just park designers. Just for the record, my nomination is not for all of Freeway Park, just that bit in the SW corner. I wonder how much it costs to maintain? Granted, the city would have to do something with those isolated bits of land, so maybe the best that can be done is to at least make it look good. I don’t think those spaces in their present form will ever be used, even decades from now. One thing that could vastly improve that area is to lid the freeway, which has actually been proposed as an amendment to Seattle’s upcoming comprehensive plan update. @ 11 I hope you will be planting some replacement trees. That used to be a park with some really nice big trees and lush landscaping. Windstorms took out the trees, and over eager clearing has left the place looking stripped and bare. @ 12 The maintenance of the Freeway park is supplemented by voluntary self-assessments by the adjacent property owners. That’s where all the colorful seasonal plantings come from. If Google maps is correct, I think the most unused park in town is the Martin Luther King Jr. park on MLK way just north of Bayview and south of i-90. This park is so cool and would be perfect for outdoor concerts in that it is a nicely terraced hillside that concert-goers could use as their seating area facing a stage that’s placed with its back to MLK way. Only I’ve never, in nearly 14 years of living in the city, seen A SINGLE PERSON or animal walking thru, sitting in or even illegitimately using this poor lonely park! It’s always empty, it seems. I would love to see the concrete removed from Freeway Park. Way too many nooks, crannies and crevices that make it feel unsafe even in the daytime. Right now it’s only use seems to be to give drug addicts a place to use out of public view. A well-planned open green space would be much more inviting and probably a welcome addition for people who live and work in the area. Williams Place Park. You’ve probably driven or walked by it. In a nice part of Capitol Hill. No one in the neighborhood seems to know it exists. 15th Ave. E. and E. John. I nominate Plymouth Pillars Park on Pike and Boren. Taken by itself, it’s a lovely little spot with inviting benches and a nice view of downtown. However, the fact that it’s wedged between the freeway and two arterials makes it completely unappealing. I’ve lived nearby for years and have yet to see anyone use it for something besides boozing, urinating, and camping.